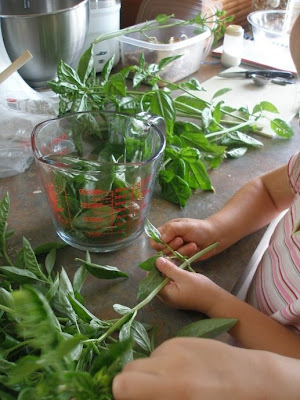 It's that time of year- pesto time. Even though I still have a gallon bag full of pesto cubes in the freezer, I made more. I just want to be very sure we don't run out. 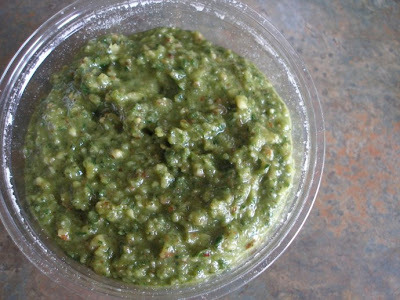 It would be a sad day to be without pesto. You can find pictures from last year and the recipe I use here. Our favorite ways of using pesto are with pasta, on pizza and in panini sandwiches. Sadie helped me this year. 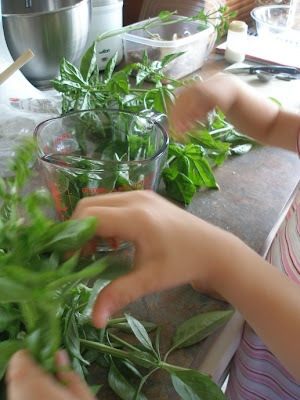 Sam only lasted through the plucking-of-the-basil-leaves stage. He had more important things to do. Like installing a ventilation system in his fort. I wasn't going to make him stop to help. 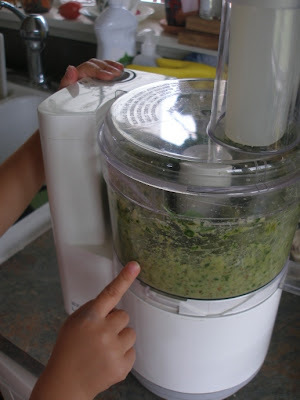 Sadie thoroughly enjoyed running the food processor and feeling the vibration. 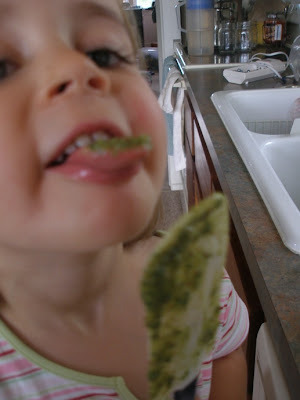 She also thoroughly enjoyed licking the spatula and bowl clean. Raw garlic and all. That's my girl. 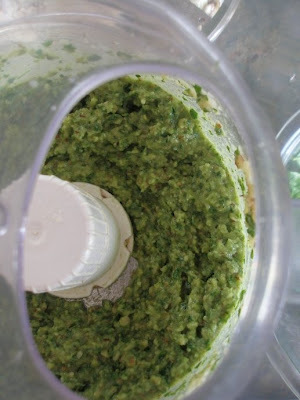 I freeze pesto in ice cube trays (and later pop them out into bags) and in the bulk parmesan cheese containers (about 1 1/2 cups each). This is all the pesto I will make this year (7 cups), but I will keep several of our plants from flowering so I can use more basil to make pesto tortes once I have roasted tomatoes on hand. We ate all of our roasted tomatoes this year. And it was a sad day when I discovered that. I just noticed on your side bar that you have pickled 24 pints of pickled beets...how big do you let yours get before you pull them up? Mavis, We grow tubular-shaped beets. I forget what the variety is called. You can see a picture of what they look like peeled (size -wise) in my "We are not canning beets next year." post from last week. That will show you the size- great for slicing and pickling:-). 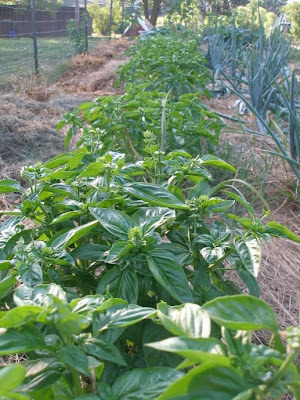 Our basil was a flop this year. Last year I froze batch after batch of this wonderful eggplant,basil, tomatoe soup. Then Gustav came through, our power was our for 2 weeks and... the rest is history. But since our garden was not a success, I'm just enjoying your pictures. So much I may just have to visit our local farmer down the street and get some yummy tomatoes! Just wanted to say...thanks for the recent pesto post that got me to come look at the recipe and finally take the plunge and make my own. It's one of the best things I've ever had..and we simply adore it! We put it on baguettes, topped it with diced tomatoes and goat cheese and put it under the broiler. Our new favorite 'pizza'. Also - wanted to say thank you for starting my day out with a blessing...each time I sign into Google Reader to read blogs, yours pops up..and the hymn runs through my head every morning.